Pathophysiology is the study of the physical and anatomical abnormalities that contribute to the development of a disease. 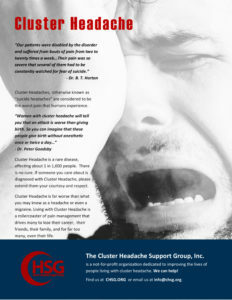 In terms of cluster headache, these reports discuss scientific findings that may eventually explain who is at risk, why it happens, and how it impacts our lives. Cluster headache is a disorder characterized by intermittent, severe unilateral head pain accompanied by cranial autonomic symptoms. Most cases of CH are episodic, manifesting as “in-bout” periods of frequent headache separated by month-to-year-long “out-of-bout” periods of remission. Previous imaging studies have implicated the hypothalamus and pain matrix in the pathogenesis of episodic CH. However, the pathophysiology driving the transition between in- and out-of-bout periods remains unclear. Previous functional and structural imaging studies have revealed that subcortical structures play a key a role in pain processing. The recurring painful episodes might trigger maladaptive plasticity or alternatively degenerative processes that might be detected by MRI as changes in size or microstructure. In the current investigation, we aimed to identify the macro- and microstructural alterations of the subcortical structures in episodic cluster headache.